Hello and Welcome to Cut Cook Eat blog. Recipes, cookbook reviews and general musing about food. 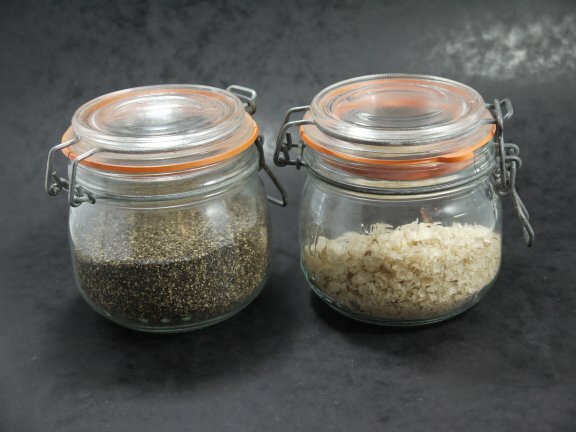 Food gadgets will be stressed to breaking point. Al fresco techniques will be covered including BBQ, smoking and planking. 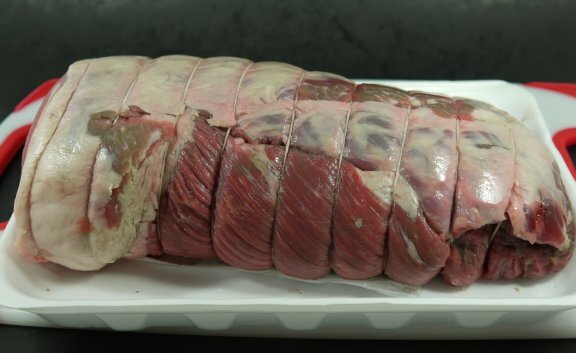 I will teach people how to wrestle with large joints of meat using home butchery techniques to make roasts, mince and sausages. About me. Please forward to friends and relatives. Recently I went to a Portuguese restaurant where they served meat on skewers to your table and cut it onto your plate with big sharp knives. Wait for it… ahhhhhh meatgasm the meat keeps coming and coming until you are fed into submission as your body shuts down all non-essential services for digestion. We lasted about two hours of solid meat feasting, oh and beer of course. I notice that these were not your ordinary skewers but square rods that were used to cook the meat on a rotisserie in a large open face oven. 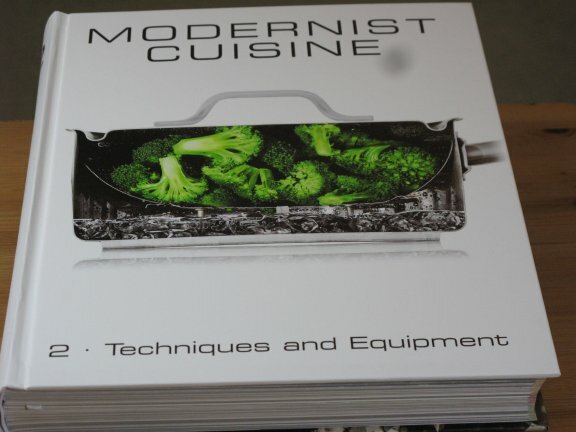 The Modernist Cuisine says that is not roasting but instead baking if you have an enclosed oven. Spit-roasting also called rotisserie is an essential feature of the cooking. 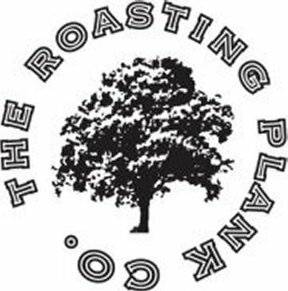 The food goes from hot when the food faces the fire or heat, and slowly rotates away from the heat into the cool which is the secret to a great roast. I had done lots of rotisserie chicken , but after being at the Buffalo Grill in Lisbon I wanted to branch out to other meats. This is my second attempt at rib of beef. I am not sure what preparation they use in Lisbon, but I believe it is a combination of marinades and also rubs. 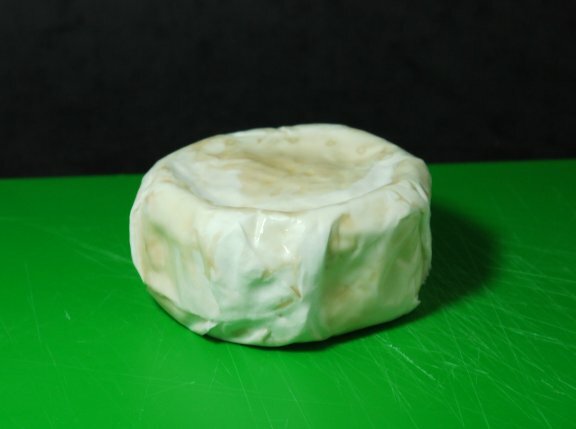 One of my favourites had a deep garlic flavour so that is what I am trying to replicate. 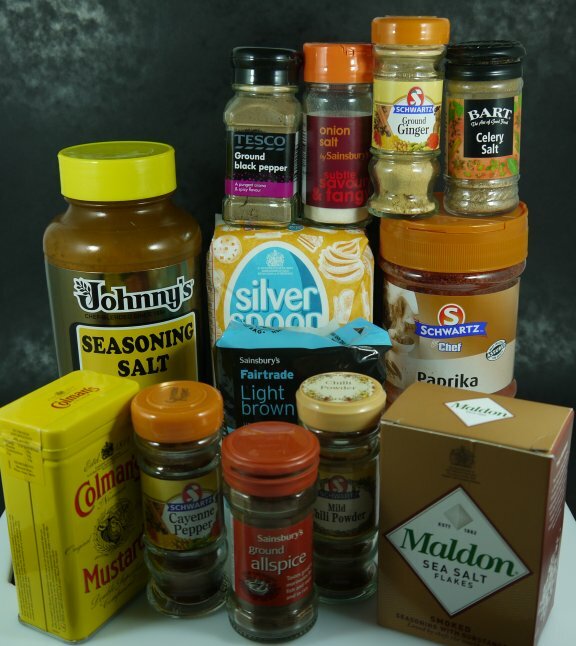 My thoughts were a rub so I went to my Bible Barbecue Bible, Sauces Rubs and Marinades and chose the Texas Sprinkle. 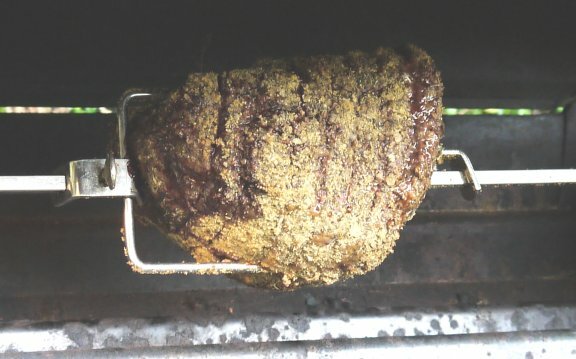 I put the skewer in and fix the arms before I put the rub on, that way it does not knock off the rub during assembly. On a big tray smash the rub into the skin all around. This is the end result. On to the BBQ with the lid held open going round and round for about an hour and half. 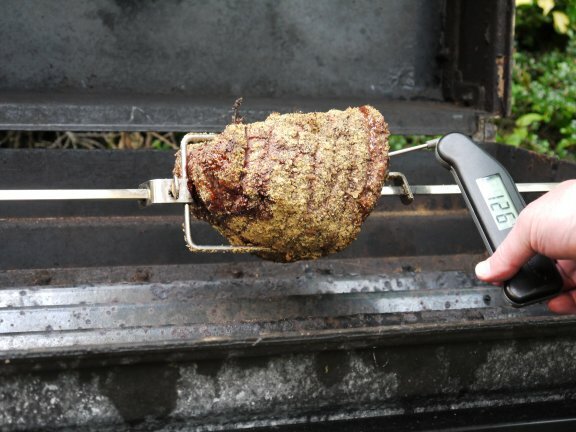 I always check the internal temperature using a Thermapen from ETI , but you must check from the side near the skewer not the edge. When the temperature gets to 134F then it is medium rare and ready for a rest. Turn off the gas and close the lid and let the meat rest and it will go up in internal temperature by possibly 5 degrees. I brought the meat into the house and made a big slice to see how well done it was. This looked just perfect for my taste. Here it is plated up. 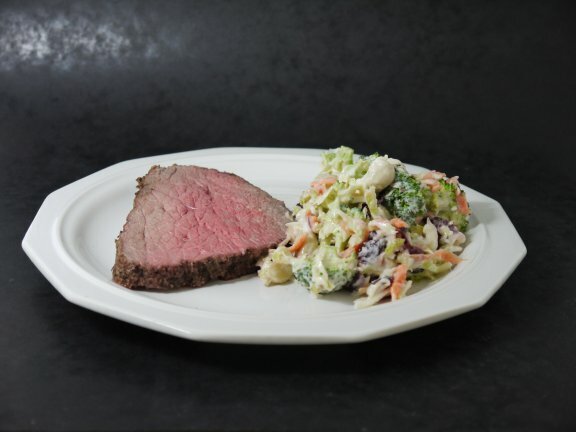 OK so I know – where is the Yorkshire pudding, roast potatoes and gravy with a side of steamed cauliflower, broccoli and carrots… well since I have started eating SANE there will be no starch in this meal, just some homemade broccoli slaw left over from when the kids were here on Friday. 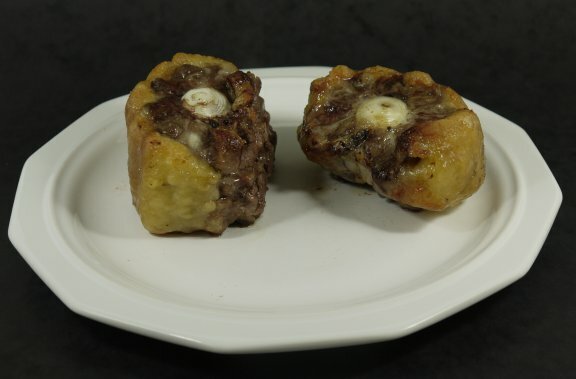 But, I NAILED – the flavour from the Buffalo Grill, it must have been a rub because I have an overall garlic taste in my mouth with a slight burn in the back of my tongue from the 3 peppers. Nice. I also cut the slice of beef (for seconds) a lot thinner which made the texture sublime. All and all a win/win for this recipe and will become a part of my BBQ repertoire. 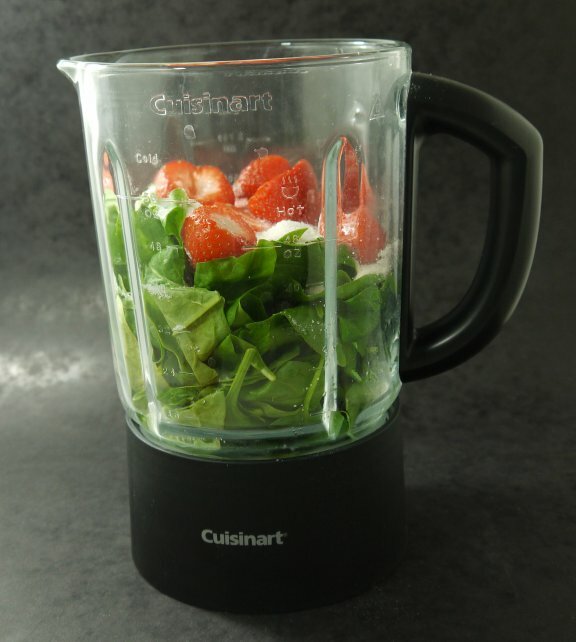 It is fresh strawberry season in England so I decided to take one of Carrie’s recipes for Green Smoothie – Strawberry Milkshake and twist it up a bit to take advantage of the local produce. 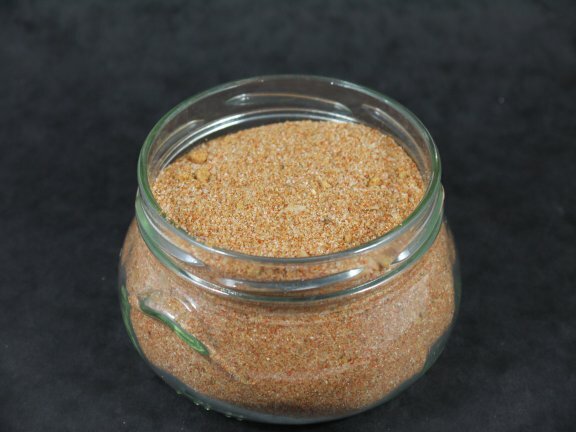 Place ingredients in the blender in the order listed, except guar gum. Blend on high until completely smooth. 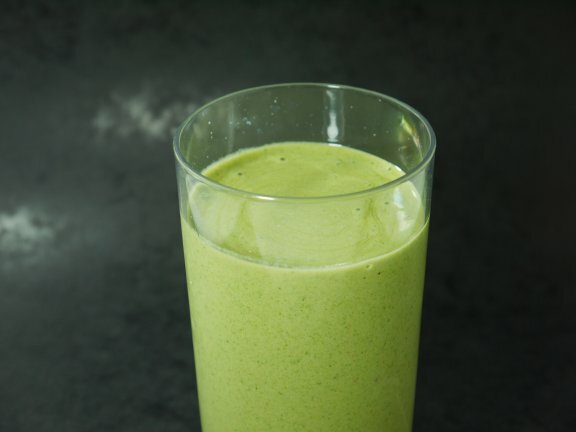 Tap the guar gum through the hole in the blender lid while the blender is still running and blend for 5 seconds. 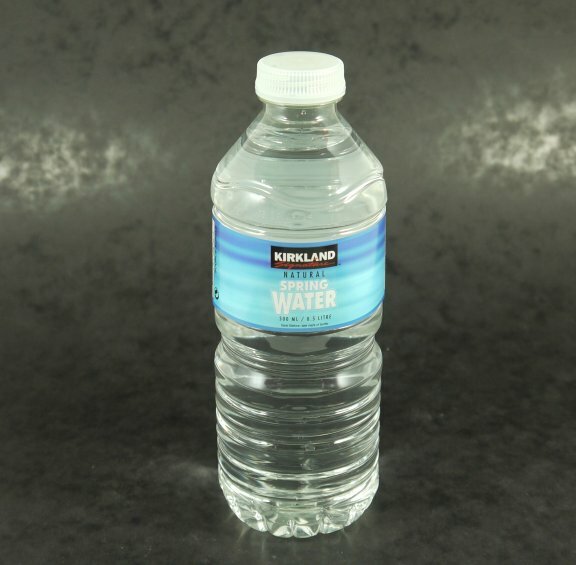 I gave some to my son yesterday and he exclaimed “That is great – you need to bottle it up and sell it”. My daughter just looked totally confused and said “That tastes like strawberries, but it is green”. 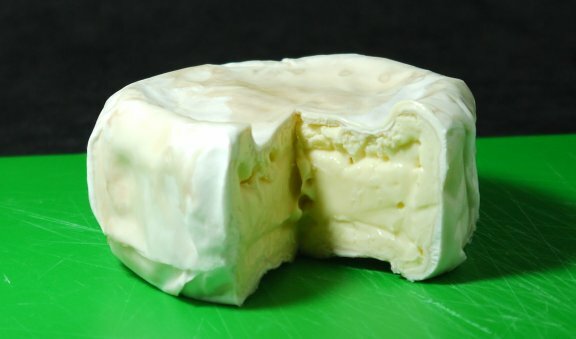 We used two+ litres of milk to produce two tuna tin size Camembert cheeses. It took all day to make, and then about 2 months of care and attention to mature… still not totally convinced it is worth the effort on a small scale. 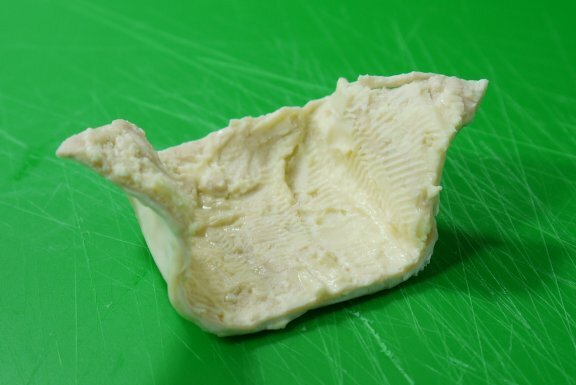 Unless you have a near free source of pasteurized, but not homogenised source of milk then it is a bit of graft. That is ok if you have nothing else to do, but the jury is still out if I will take it on in the long run. because I wanted to master the art of Wiener Schnitzel. In my first attempt I used panko bread crumbs with flour and egg in olive oil but they just burned and the veal was edible at best. My second attempt was using my own bread dried and crumbed in a blender. I mixed olive oil and butter in the frying pan and the crumb crust turned out well and the veal was medium rare, but it was tough. Normally male cows that are produced during milk production meet an untimely demise rather early in life since they cannot produce milk. Red veal is these young male cows allowed to run around outside and feed on grains and milk and grow for ½ a year or so. This is unlike the white veal which is kept in the dark in cages so they cannot move and force fed milk only. 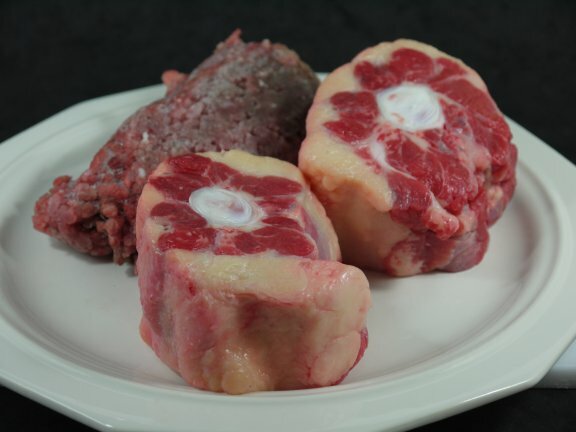 The white veal is very tender when cooked rapidly, but the red veal needs a little more cooking to get that tender mouth feel without having to torture cows to achieve this. 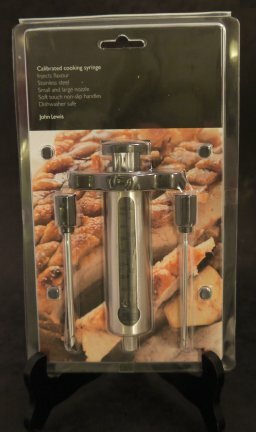 In my third attempt to have the ultimate Wiener Schnitzel I am going to use the Sous Vide and cook them rare at 131°F for 3 hours, then coat in flour and shallow fry in olive oil and butter until the coating is golden brown, which I hope will happen before the meat is overcooked inside. I decided on smoked sea salt and cracked black pepper for the seasoning in the bag. 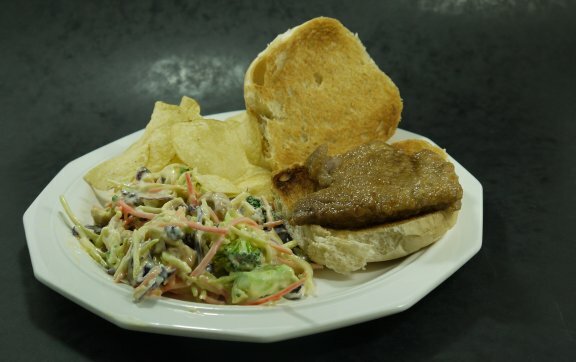 It includes another new item from Costco which is broccoli slaw, and some cheeky salt and vinegar crisps. All in a very nice dinner, and the Schnitzel was tender and crunchy at the same time just as it should be. Sorry for not posting for such a long time. No real excuse except that I was working quite hard the last 8 months on an issue we had with our product which I hope is now behind us. Also it is supposed to be summer in the UK but at the end of June at 6:00 it is about 60°F so windy and cold. The smoker has not even seen light of day this year yet!!!!! 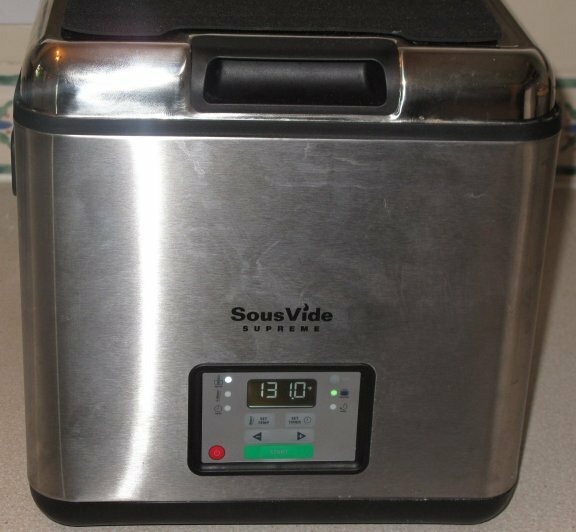 Sous Vide cooking it is very scientific and based on thermodynamics, specifically entropy. 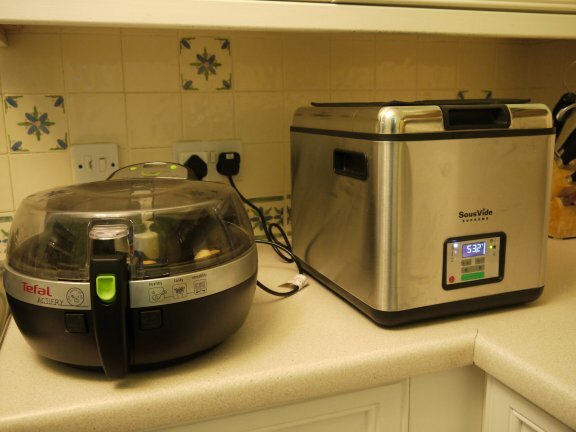 You vacuum pack the food and put it into a water bath of certain temperature for a period of time and sooner or later all the water and food are at the same temperature and stay that way. The result is perfectly cooked food. 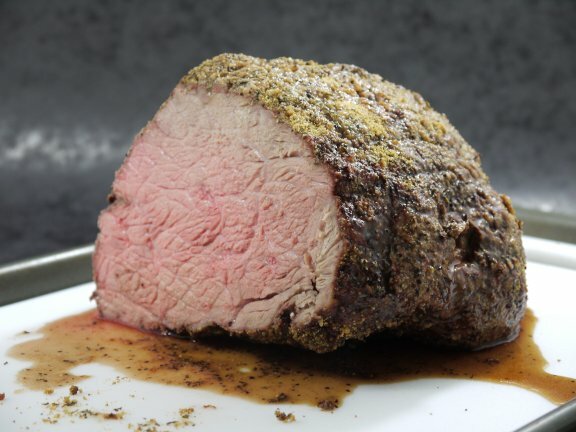 Tender meats can be cooked from 1-4 hours with the same result. Tough meats that require the fat to turn to collagen for the silky texture can take days in the Sous Vide but if you are off by an hour or two who cares. Until today I have stayed away from cooking fish in the Sous Vide because of the chaos that I have encountered during my research. 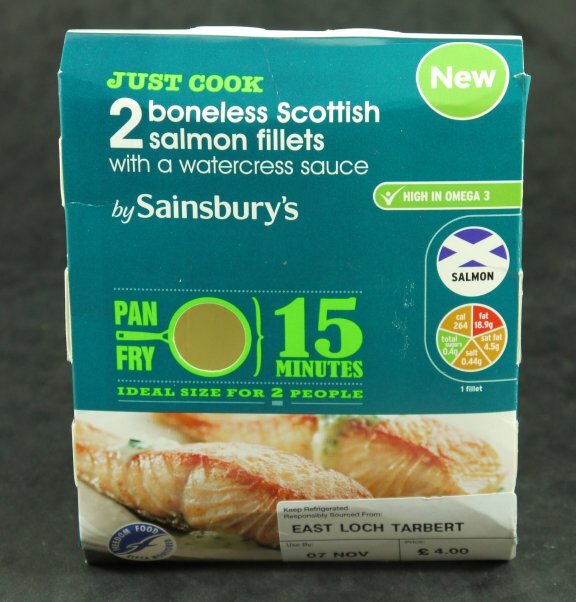 With fish the cooking time is down to minutes, and it seems that tuna and salmon are even more particular. After 35 minutes, I took it off the brine, I drained and patted it dry and seasoned it with Pepper and a tiny bit of salt – It was already seasoned by the brine – I set the circulator to 50°C for 28 minutes, it’s the time I got from Douglas Baldwin’s “A practical guide to Sous Vide cooking“. In a previous post he said that 53°C was too high and the fish fell apart. Recommends: 46°C for no specified time, but remove when the internal temperature reaches 46°C. Aside: There also seems to be an issue with fish in the Sous Vide if you are not going to eat it right away. 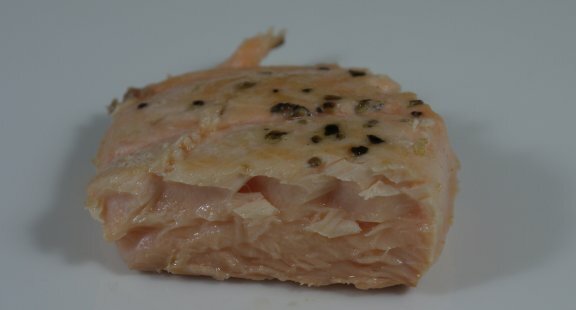 If you want to have cold cooked salmon then you need to take it to a higher temperature of 60°C for a longer period of time. This will pasteurize the salmon, then it needs to be plunged into an ice bath in the vac bag for an hour before refrigeration. I am not sure why you need to skin the fish, but I think it is so you can fry it later and serve on the side. Me, I chuck it in the bin because it disgusts me. I used a brine of 2% Malden Sea Salt with bottled water for an hour. 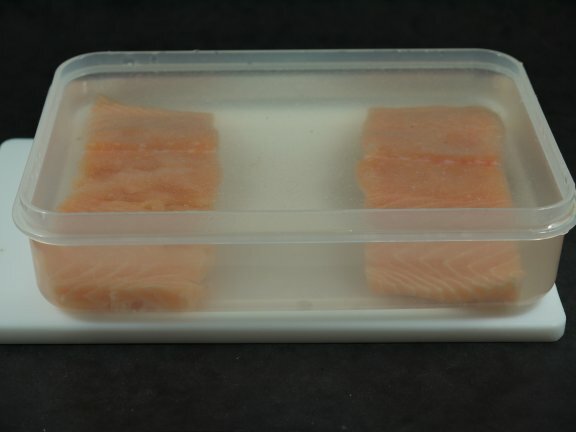 Brining is used to firm up the fish and also remove serum albumin which is the egg white stuff you see when you cook salmon. It is edible but not very nice. 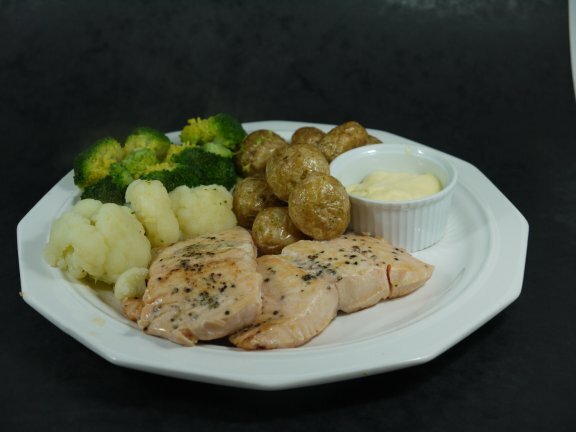 I decided that the salmon would go well with some new potatoes. I like to twist up the new potatoes a bit by cooking them in the Tefal ActiFry . I steamed the broccoli and cauliflower, but made sure that I used bottled water as our water is hard here and it toughens the skin. When the salmon was done, I cut them out of the bag and browned them on each side in a hot pan with some unsalted butter. Here was my dinner platted up. Oh with a side dish of hollandaise sauce of course. This salmon was beautiful, so moist and flakey. Next time I will crank up the salt to 4% and add 1-2% sugar also for the hour brine. The Sous Vide will be at 51°C for 30 minutes. Hopefully this will be a bit firmer fish and allow me to brown them a little bit longer in the frying pan. Smoking beef brisket, low and slow. 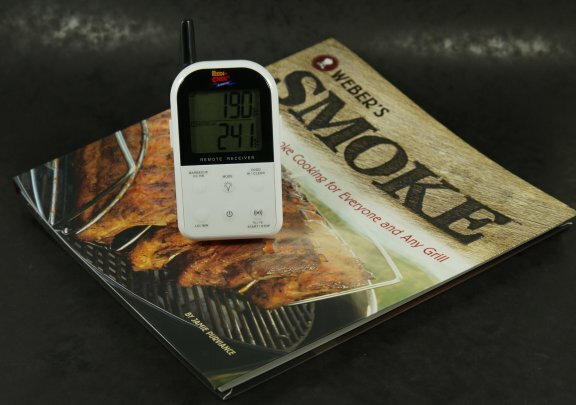 I adapted my recipe from Weber’s Smoke: A Guide to Smoke Cooking for Everyone and Any Grill . 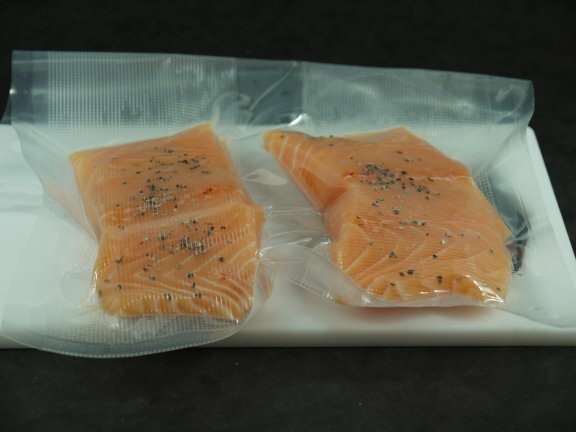 Cover and refrigerate – put into a Sous Vide bag and double sealed. 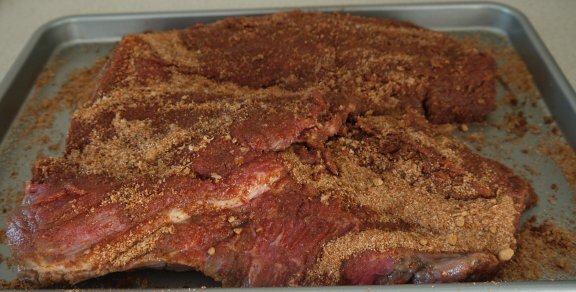 About an hour before you are ready to start smoking, take the brisket out of the refrigerator to let it warm to room temperature. This is going to be a long cook so you don’t want to waste any time getting it up to ambient temperature. This is also a good time to apply the rub with spices. This allows the rub to change from a dry powder to a sticky glaze that will become what pit bosses call “bark”. 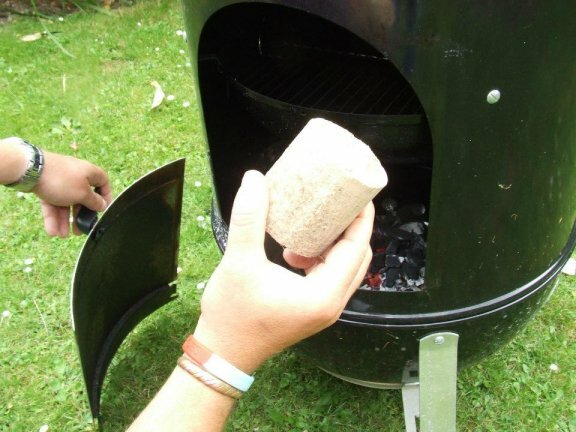 About ½ hour before you are ready to smoke, put a chimney full of restaurant grade charcoal into the smoker ring. Since you don’t want to flavour the meat with any kind of petroleum starter fuel, I use newspaper knots. Take two sheets of newspaper and roll them up along the long side, then tie two overhand knots in them. Make 3 of these and put them in the bottom of the chimney. Scrunch up another two sheets and put them under the chimney. Fill the chimney with charcoal over the paper knots and then light. By the time we are ready we will be working with embers. Pour out the embers on top of the other unlit charcoal in the smoker. 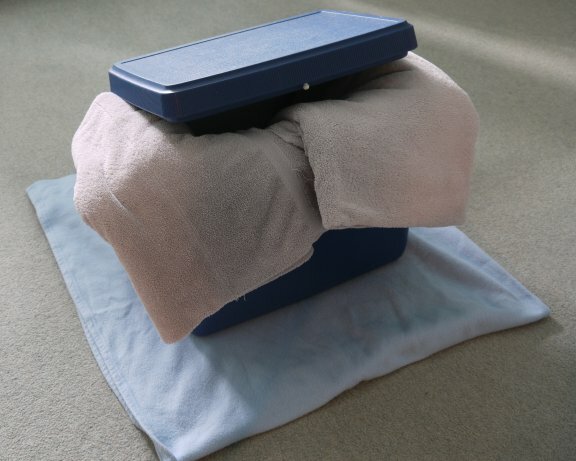 Assemble the bottom section and insert the water bowl. Put about two inches of hot water in the bowl. On goes the brisket for about 4-5 hours. 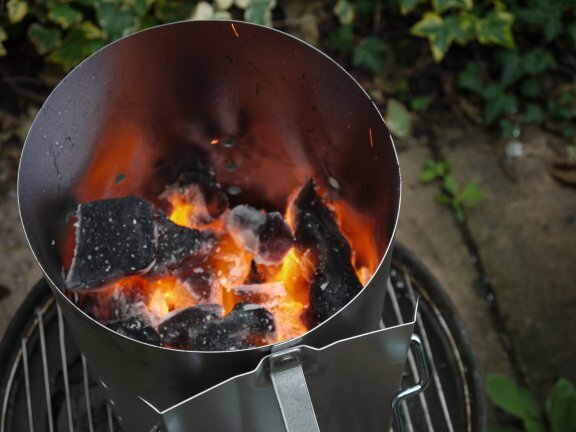 Every hour add 3 more chunks of hickory, check the water and poke the charcoal to knock off the outer ash and maintain a temperature of 225-250F. Smoke the brisket at 225F for 4 hours and goal is internal temperature of 160F. When the internal temperature reached 160F then the first stage is done. 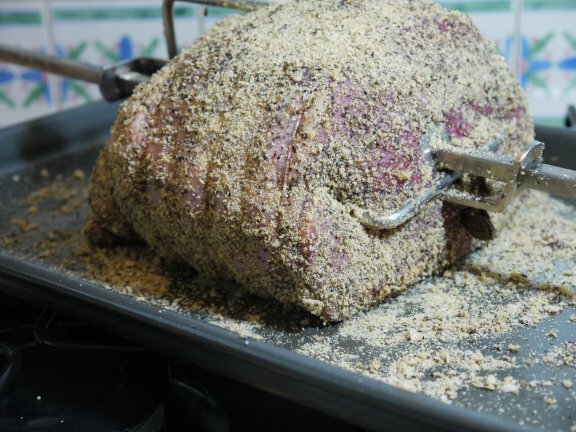 Now I need to employ a little cheat, a Texas Crutch, which is to double wrap the brisket in heavy duty foil with ½ cup of the beef stock we used to inject last night. We want to eat today, right? We are too old and tired to smoke overnight and have to get up for the 3 o’clock feed again, right? So a little cheat will mean that we get past the stall which occurs when the meat starts to sweat and cools (like an athlete). This will just about half the time for this next stage from 8-10 hours to 4-5 hours. Normally on the BBQ circuit teams would cook over night, but I am not into that…yet. Now it is the ascent to the summit of tender smoky spicy beef, and this is where the concept of a recipe all falls apart. 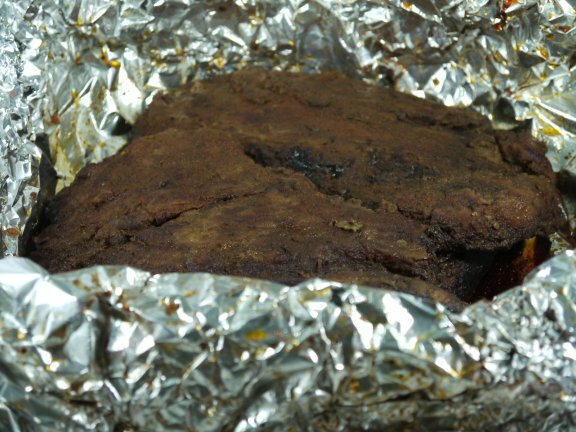 Actually that is what you want, for it to all fall apart, the brisket that is. The next stage is to cook at 225-250F in foil for another 3-5 hours until the internal temperature is 190-195F. Depending on your cut of meat and the amount of fat this can be even longer than 5 hours. 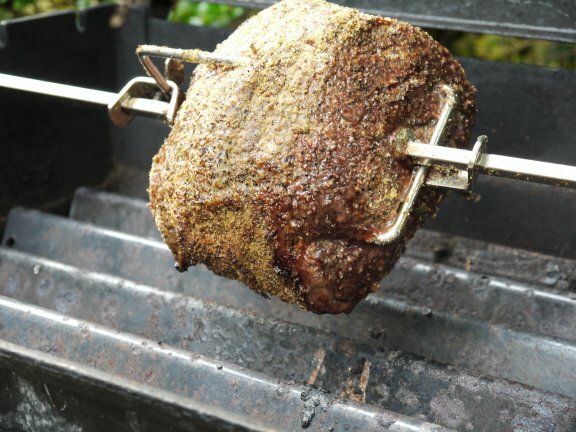 A seasoned pit boss will say “he feels when it is done” by using a temperature probe or fork sticking the meat and seeing if it yields easily. My fire in the smoker lasted the 4 hours and the temperature was 190F but it was still not yielding and a bit firm in the thick part of the meat. I wanted to clean up outside so I put the brisket into the oven at 225F (another cheat but it would be dark soon). It was 5:00PM and I checked the meat every half an hour until I reached the summit at about 6:30PM. After about 10 hours of cooking I was at the top. I opened the foil for 15 minutes to let the steam out. But now I had to slowly descend the mountain to dinner. Which is a beer cooler and couple of towels. 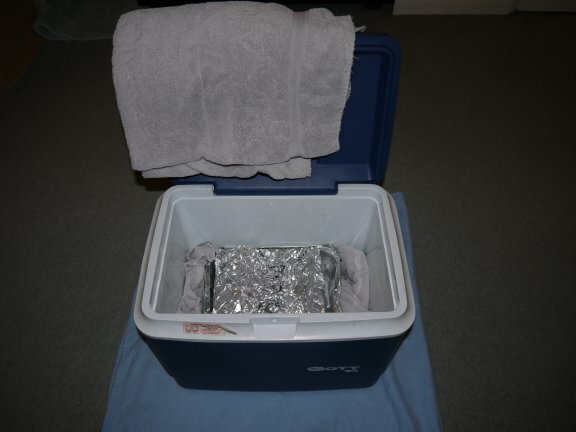 In to the cooler goes the brisket in foil. After a 2 hour descent the brisket is finally done. And here it is plated up. It is 9:00 PM and I am shattered! It tasted really nice and smoky at the beginning and had a soft and moist texture followed by a long spicy flavour. I have now done all the meats required in a smoking competition; ribs, chicken and brisket. Who’s the “PIT BOSS” – me! This is what it looks like after it has been mixed. 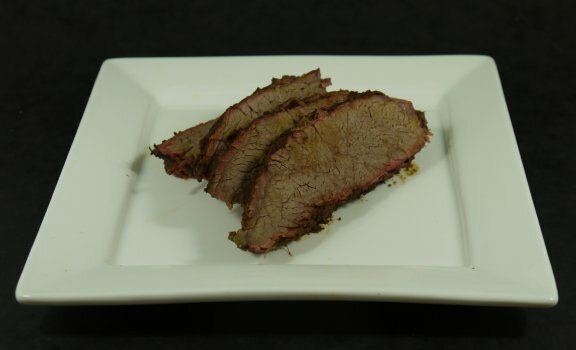 You need to let the brisket come to room temperature before smoking, which takes about an hour. This is about the right amount of time to have the rub transform from a powder to lovely gooey sticky sauce. When the smoke and heat hit this sauce it will transform into bark which will encase the brisket and keep all the lovely juice that I injected to keep the meat moist during the smoking session. Now all I have to do is smoke it for 10 hours before I can eat. With beef stock. This was the first time I used my new food syringe. I had purchased the brisket at Costco earlier in the day because today is prep day and tomorrow is smokin! First get rid of the string, because we want more surface area to inject and apply rub. This is supposed to be kind of messy so I put the opened brisket into a foil pan, which we will use later also. Out with the beef stock. I selected the smaller needle and pulled a cylinder of stock and then inserted the needle into the meat about half way and pushed the plunger as I pulled the needle out. I had a couple of fountains and went all the way through a couple of times, but hey this is my first go. When it works you can see the meat swell and a little puddle of stock when the needle is removed. 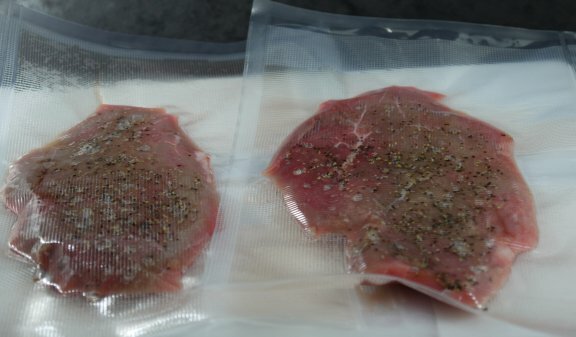 The brisket was inserted into a Sous Vide bag and doubled sealed. 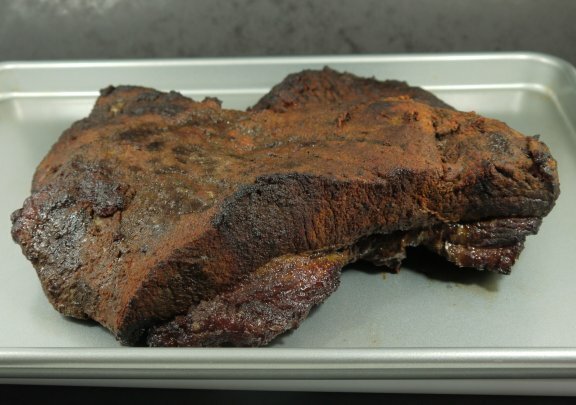 Night, night brisket enjoy a night in the fridge, see you tomorrow! All I wanted was a couple of sections of a cow’s tail, is that too much to ask? I am in town so I check the local Waitrose for some oxtail, fresh or frozen I don’t care – nope. In the local Sainsbury’s for the weekly shop: tuna – yes, ham – yes, vegetables – yes, cow tail – nope. I know let’s try the butcher at the farm shop on the A4. Fresh and frozen nothing but tags showing where they should be. Asked the butcher, he could have some by Thursday – nope. Off to another butcher, I could have some if I wanted 2kg on Thursday – nope. Last chance the Sainsbury’s Superstore – bingo! 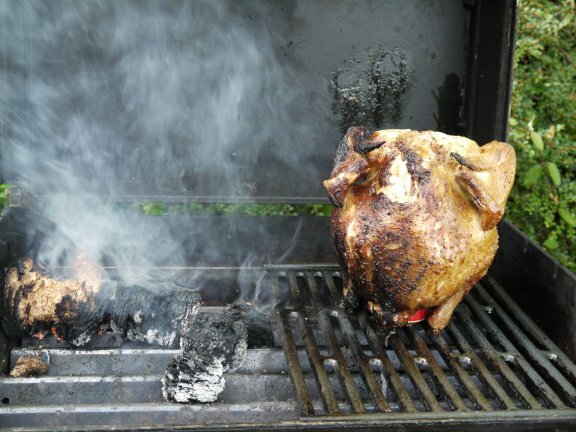 Smoked Chicken but now it was the premiere league. First we need to have a way to impart flavour and juice like no other within the meat. So I purchased a food syringe, which was rebadged by Heston so had to be good. has a section on making stocks. They have done extensive research into stock making and have debunked several of the older concepts of making the best stock. The process has several steps and each one takes quite a bit of time and also money. I can now understand why the Modernist Cuisine dinners cost so much, especially when to make the stock used in the dish costs over £15 by itself, and that does not include the petrol finding the raw ingredients!!!! First we need some meat, but we are not going to eat it we are going to throw it away. Then we need some vegetables, but we are not going to eat them we are going to throw them away. We also need some spices, but we are not going eat them we are going to throw them away with the chopped vegetables. Let’s put this another way, this is NOT stew but instead stock, which is clear and full of flavour and will also fit down the syringe. When it is done we set it aside to add to the pot. 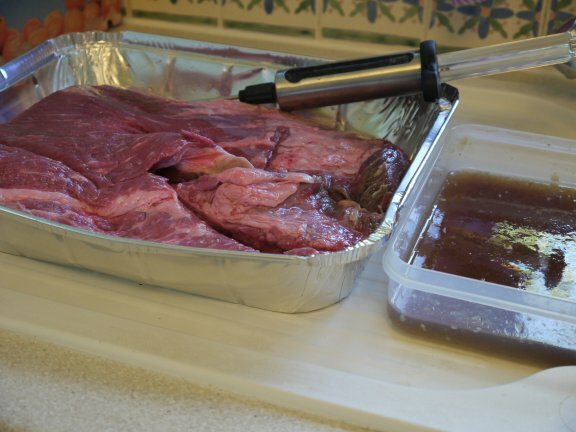 Next we need to SousVide Supreme the mince to extract the meat juice. This is quite a high temperature for Sous Vide and resulted in a rock hard chunk of mince and some really strong flavoured juice. Now that the meat is prepared then the vegetables need to be bulked out. One of the old ways to make stock is to take carcase and large junks of vegetables and boil them for long periods of time over a low heat. 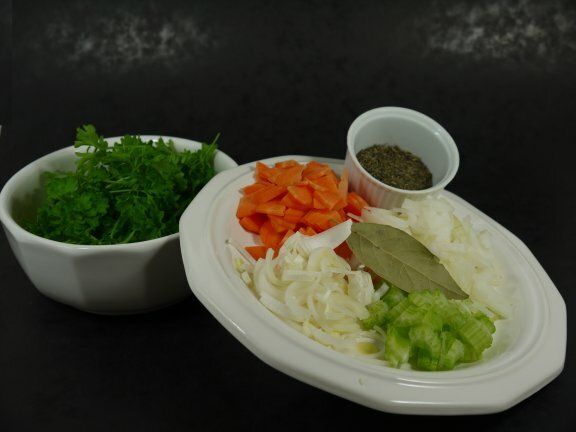 The Modernist Cuisine method is to cut the vegetables thin and grind the meat to increase the surface area which can be transformed into stock. Also instead of using a stock pot with an open lid the MC guy’s employee a pressure cooker which works faster and also minimizes the loss of flavour to the surrounding air. 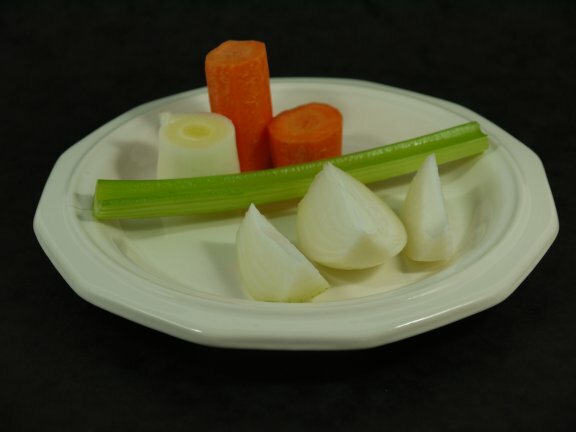 Notice the increase of surface area on the vegetables when they are thinly sliced verses the picture when they were whole. 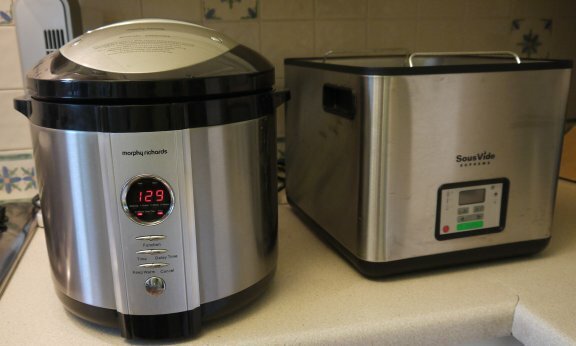 We are ready to use the Morphy Richards 48815 Digital Electric Pressure Cooker , so into the pot goes the oxtail, the juice from the to SousVide Supreme mince and all the vegetables and spices. 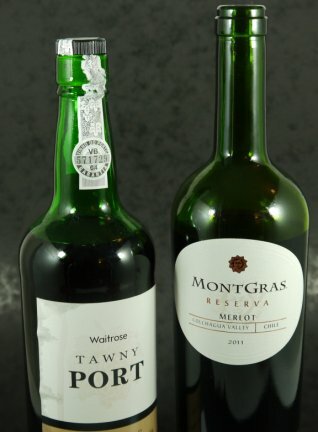 Add a couple of flavour enhancer’s in the form of red wine and port. This gets pressure cooked for 2.5 hours which is a very long time in PC time. This would probably equate to about 7.5 hours of simmering on the stove. It is a crazy long time because my pressure cooker maximum is 1.5 hours on the timer, so I had to do two sessions. When this was done, it tasted great, such depth. I put it in the fridge overnight and then removed the fat and put it into the freezer ready for the kick-off of brisket day!!! As you probably know I have been into smoking meat lately. There are several techniques that are used in the USA and are now making an appearance here in the UK. 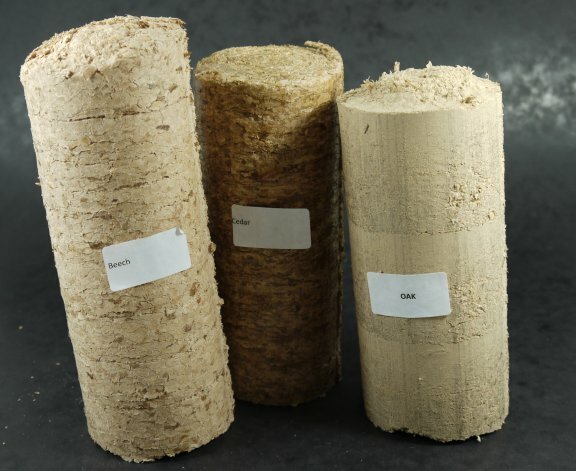 They are based around using hard woods as a flavour enhancer and can come in the form of wood papers, wood planks used once, wood planks used many times and wood chunks and chips. 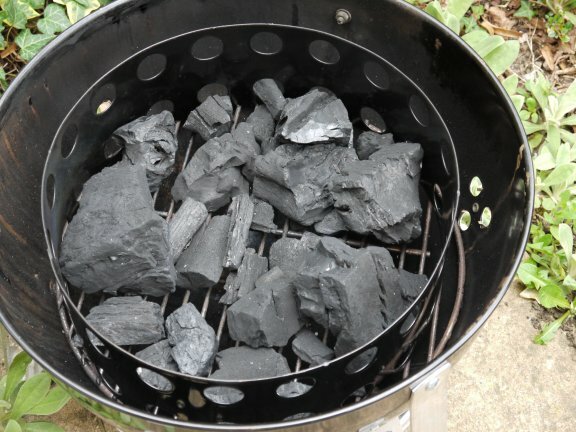 Last week I saw posting that showed what looked like a compressed log of wood chips which was being used in a Weber Smokey Mountain. I went to their website to try and buy some. But I could not find them, so I emailed them and asked what was up. The next thing I know I am a beta tester of a new product. I had used Cedar planks for salmon in the past and also Oak chunks in my Weber Smokey Mountain, but I had never used Beech. 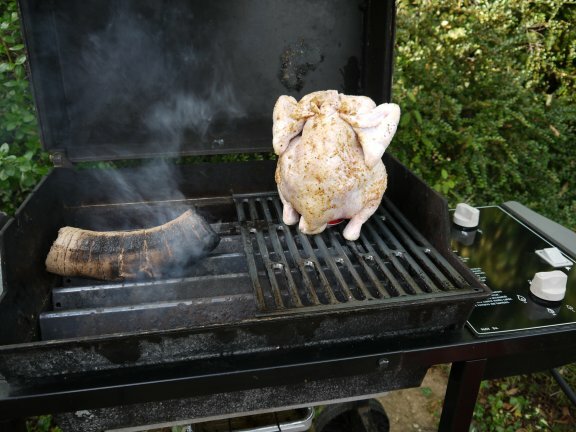 One other thing I have never done is beer can chicken where you cook the chicken upright sitting on a beer can partially full of beer. Win/Win and it was a steaming hot day in England. Off to Costco to get a really nice chicken. 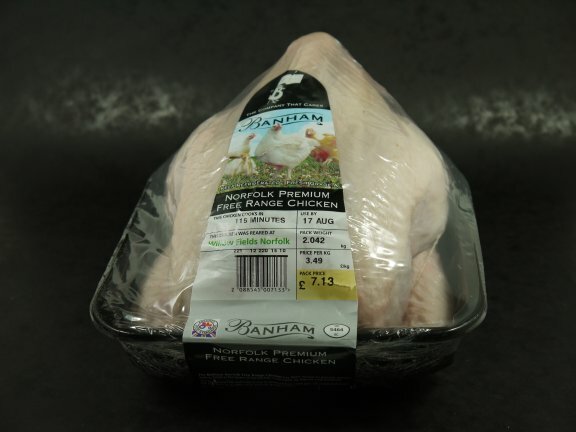 This chicken needs a bit of work to make sure it is really juicy. So I took my Jaccard to it and put lots of little holes into the breast and thigh. I was kind of following the recipe for beer can chicken in Weber’s Smoke: A Guide to Smoke Cooking for Everyone and Any Grill . I decided to brine the chicken for a couple of hours with 1/8 cup of Sea Salt an 1/16 cup of coarse black pepper. Put it in a cooler with some water and ice before you are going to cook. 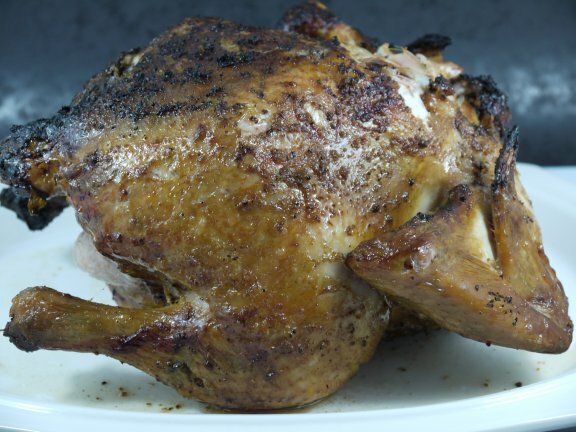 I dried the chicken with paper towels and the basted it with groundnut oil and the applied the rub. I got a can of beer out and poured about 1/3 of it down the drain (what a waste, but it was warm and nobody likes warm lager). I smashed a couple more holes in the lid with a can opener and we were now good to go. Now I need to setup the BBQ. I decided to put the wood log on the flavour bars, but not over heat. But after a few minutes it was not really getting going, so I put it over the direct flame. In another 5 minutes I had the opposite effect which was that it caught fire, but that was kind of good since I now had smoke. I blew out the fire and move it back to indirect heat. I turned the back burner down to low so I was cooking the chicken indirectly and this also gave some heat to the log, so we were smoking!!! 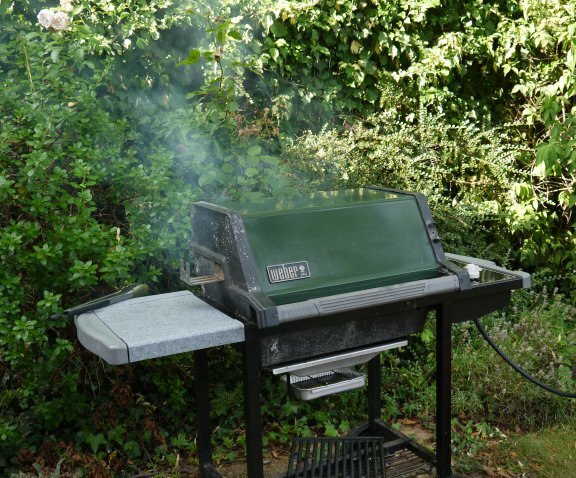 But I left the front burner on high – oops after about 45 minutes I noticed that the sound of drip, drip of fat from the chicken had turned to sizzle…. Fire! I turned off the gas and got a glass of water to dampen things down. A little attention and a sprinkle here and there got things back together. With the front burner down to medium and the back burner on low everything was good and we were smoking again. After about an hour I checked the temp and the chicken was done. After a BeerCanEctomy the chicken was on a platter and in-da-howze for some resting and then troughing. 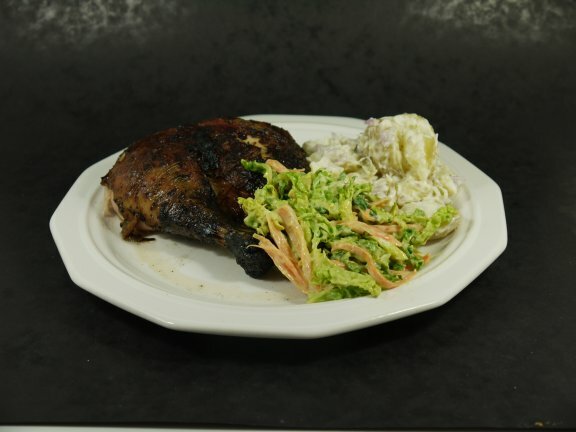 And here it is plated up with some honey mustard coleslaw and some potato salad. It was really juicy and moist. The skin was very nice with the rub. Beech is a light smoke flavour but it really worked with chicken. I am thinking that the left-over chicken will be great on a flour tortilla with Chipotle paste and some salsa, lettuce, guacamole and sour crème tomorrow oooohhhh yyyaaaaa eat it learn!!! !.